Jakarta, also Djakarta, formerly Batavia, capital and largest city of the Republic of Indonesia, centrally located within the country on the northwest coast of Java Island at the mouth of the Liwung River. Batavia, as the city was called by the Dutch, was the capital of the Netherlands Indies for most of the 17th through early 20th centuries. Jakarta dominates Indonesia's administrative, economic, and cultural activities, and is a major commercial and transportation hub within Asia. The climate is hot and humid year-round. Rainfall occurs throughout the year, although it is heaviest from November to May. The average annual precipitation in Jakarta is 1,790 mm (71 in). The city lies on a flat, low alluvial plain and is prone to flooding during periods of heavy rainfall. There is little seasonal variation in temperature; the average high in January is 29° C (84° F and in July 30° C (86° F). In 1966 the government declared Jakarta a special metropolitan district with a status and administration similar to that of a province. For these purposes it is called Daerah Khusus Ibukota Jakarta Raya, often shortened to DKI Jakarta. It has a total area of 661 sq km (255 sq mi). Since the early 1970s the urban sprawl of Jakarta has grown into the adjacent province of West Java. For development and planning purposes, this large urban area is known as Jabotabek, an acronym for Jakarta and its West Java satellite towns of Bogor, Tangerang, and Bekasi. Jakarta is aligned along a north-south orientation from the old harbor of Sunda Kelapa and the original site of European settlement on the north, to the city's southern suburbs. Kota, the city's oldest commercial area, is located south of Sunda Kelapa. Just south of Kota is Glodok, a banking, retail, and residential neighborhood with a large ethnic Chinese population. 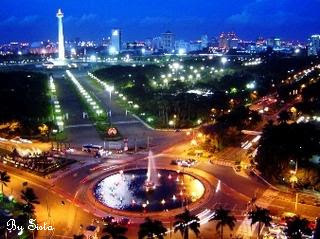 Merdeka Square, with Monas, or Monumen Nasional (National Monument) at its center, dominates the city's central district. 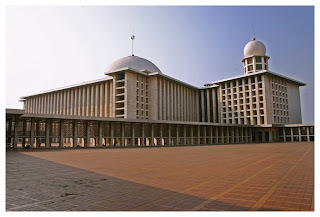 Surrounding the square are the presidential palace, the National Museum, and the Istiqlal Mosque. Just south of Merdeka Square, along the connected arteries of Jalan Thamrin and Jendral Sudirman, are major hotels, financial institutions, and the headquarters of domestic and multinational corporations. This main corridor continues south to connect with Kebayoran Baru, a residential suburb and important shopping area built after 1945. Other residential areas are the Grogol, Taman Sari, and Senen neighborhoods near the central area of the city. The southern suburbs of Cikini, Menteng, and Gondongdia developed as exclusive Dutch residential areas; they are now fashionable neighborhoods for wealthy Indonesians and foreigners. Housing is one of Jakarta's most serious problems. The quality of the buildings varies widely; more than half the structures are temporary or only semipermanent. The most common types are single-story structures made from wood and, occasionally, bamboo mats. Also common are single-family detached or semidetached houses made from brick, cement, and wood, with tile roofs. The government has made some effort to construct low-cost housing. Luxury houses in limited-access neighborhoods, such as Kemang, are increasingly common on the southern fringes of the city. Electricity supply has expanded to meet the city's needs and most houses have electricity for lighting. However, water supply and sewage disposal are still inadequate. Less than half the households use piped water for drinking. Fewer still use piped water for bathing and washing. Only a small part of Jakarta is served by piped sewers and many homes lack septic tanks. Jakarta has more than 100 private and public institutions of higher learning, including the University of Indonesia, founded in 1950, the nation's oldest university. Despite the large number of institutions, there are more students than these schools can accommodate. There is also an insufficient number of vocational institutions to meet the demand for training. Jakarta's cultural institutions showcase a variety of Indonesian art, including textiles, batik cloth (cloth that is dyed by a technique using wax), wayang orang (traditional theater with human actors), and wayang kulit (traditional puppet theater), painting, and Javanese and Balinese gamelan (drum-and-gong ensemble) music. See Indonesian Music; Indonesian Dance. Important museums include the Jakarta History Museum, the Museum of Fine Arts, and the National Museum. Notable landmarks include the former Dutch city hall (Stadhuis), which now houses the Jakarta History Museum; Istana Merdeka, the presidential palace; and Istiqlal Mosque, with space for more than 10,000 worshipers. Among the city's parks, Medan Merdeka is the most well known. 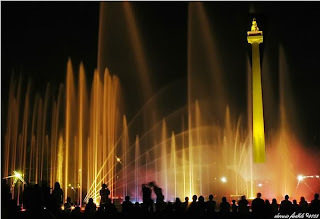 The park features the Monas (Monumen Nasional, or National Monument), a pinnacle towering nearly 140 m (nearly 460 ft). The Jabotabek region offers many recreational opportunities. Kebun Raya, a world-renowned botanical garden located in Bogor, was laid out during the 19th century. The Ragunan Zoo is located south of the center of Jakarta. Taman Mini Indonesia, located southeast of the city, is a large cultural theme park depicting the arts, customs, and lifestyle of each of Indonesia's 27 provinces and districts. Sporting facilities include the Senayan Sports Complex. The Ancol complex on Jakarta Bay includes an oceanarium and Southeast Asia's largest amusement park. A variety of open-air markets are located throughout the city. Jakarta's origin can be traced to a Hindu settlement on Jakarta Bay as early as the 5th century ad. By the 12th century, Sunda Kelapa served as a port for the Hindu Pajajaran Kingdom in the interior of Java. A Hindu king granted Portuguese traders permission to build a fort at Sunda Kelapa in the early 16th century, but in 1527 Fatillah, a Muslim leader from the north, conquered Sunda Kelapa and renamed the settlement Jayakarta. Dutch traders captured the city in 1619 and renamed it Batavia, which became the capital of the Netherlands Indies. They rebuilt the settlement to resemble a Dutch city with canals. Activities centered around a walled fortress and the warehouses of the Dutch East India Company. The humid climate and the fort's location on a low-lying swampy area contributed to a high incidence of disease. In the early 1800s the city expanded as the Dutch began moving to the south, where the ground was higher and less prone to breed diseases. The British captured Java in 1811 and ruled the island until 1816, when it was returned to Dutch control. Between 1920 and 1940, the city expanded further and gradually became modernized. Japan took possession of the city in 1942 during World War II and renamed it Jakarta. Following the Japanese defeat in 1945, the Dutch again took control, despite the demands of Indonesian nationalists who declared independence on August 17, 1945. The Dutch remained in Jakarta until 1949 when they formally transferred sovereignty to the new Republic of Indonesia. During the Sukarno presidency (1945-1968), many buildings and monuments were added to the city's skyline. The country's second president, Suharto, restructured the government and energized the economy. As a result, Jakarta became the recipient of considerable investment. In the mid-1970s Jakarta's physical and economic planners began addressing the needs of the Jabotabek region. The plans aimed to restrict growth along the coast, consolidate urban expansion into alternative growth centers, and provide better accessibility to employment and services. Planners have achieved considerable success in expanding the availability of urban services and the Kampung Improvement Program has had a dramatic effect in improving the most depressed neighborhoods of the city.